Its light straw color brings out a pretty aroma of hazelnut and dried fruit. Taste-wise, this wine is vinous, strong, firm, deep and has a strong character with a mineral edge. Its finish is tight and strong with thin and melting bubbles. Virile wine. The 1920s marked the golden age of Ayala. Supplying the royal courts of England and Spain, it ranks among the greatest houses of Champagne with a production of over one million bottles per year. Champagne AYALA is one of the oldest Champagne Houses, established in Aÿ, in the heart of the Grands Crus, since its foundation more than 150 years ago. Independent and family, she produces wines of hight level. Modern and dynamic, the AYALA House is in full renewal thanks to its fresh and elegant style. 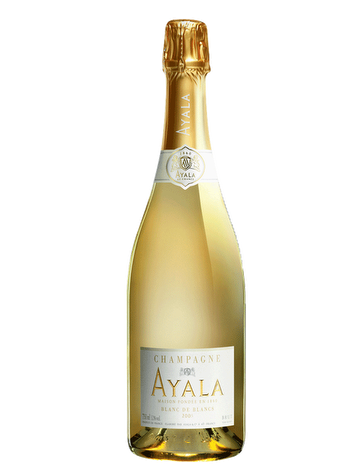 Vinification: This Ayala Blanc de Blancs champagne is characterized by a low dosage, about 6 grams of sugar per litre and long aging (6 years on lees).